When you reach a special treasure pot, hit it so that the bonuses fly out, collect the extra life and walk off the screen, then walk back to the chest to collect another life. Continue this until you have enough lives to complete the game. 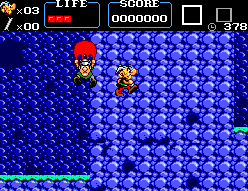 On round 1-1 as Astérix, enter the second well using the red bombs, and head to the left of the screen as far as you can go. 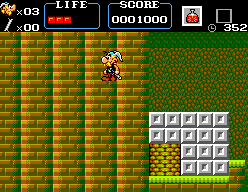 Then jump up next to the blocks on top of the well and keep holding left to go through the wall and enter a secret room. 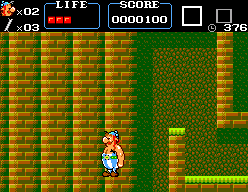 On round 1-1 as Obelix, go into the first well, and stand on the platform at the left of the screen. When it falls, walk left to go through a wall into the room. On round 2-1 as Astérix, jump down at the right edge of the gap beneath the first two spinning platforms, and keep holding right. Alternatively, jump down the first gap and head right, then punch-jump off one of the parachuting enemies and keep holding right to go through the wall and enter a secret room. 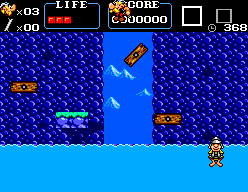 On round 2-1 as Astérix, once you reach the second spinning platform above the water, quickly jump up to enter a secret area. 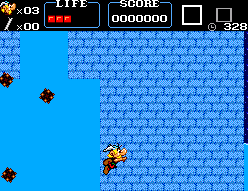 On round 2-1 as Astérix, go underwater and keep heading right until you reach a wall. Float down until you are near the bottom of the screen and keep holding right to go through the wall into a secret room. Play as Obelix in round 2-1, jump onto the rotating platforms to the Menhir container, then jump to the platform on top. Do small steps where there isn't grass and you will suddenly fall into a secret room. 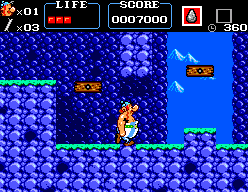 On round 2-1 as Obelix, once you reach the last spinning platform before the water, jump onto it from underneath when it is spinning, then quickly jump up to enter a secret area. 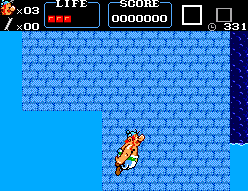 On round 2-1 as Obelix, go underwater and keep heading right until you reach a wall. Float down until you are near the bottom of the screen and keep holding right to go through the wall into a secret room. 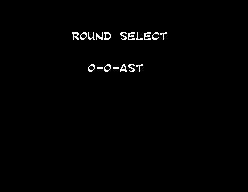 Use a Pro Action Replay cartridge with code 00C08F00. Re-patch where it looks like the cheat was removed, by writing 00 at ROM address 001214. 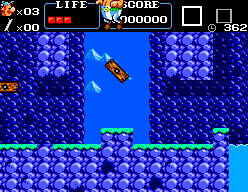 The game returns to the title screen after each level.